Presidential election results map. Blue denotes constituencies won by Lungu, and Red denotes those won by Hichilema. General elections were held on 11 August 2016 to elect the President and National Assembly. A constitutional referendum will be held alongside the elections, with proposals to amend the bill of rights and Article 79. The previous general elections in 2011 resulted in a victory for the Patriotic Front (PF), whose candidate Michael Sata was elected President, with the PF winning 61 of the 150 seats in the National Assembly. Following Sata's death in October 2014, early presidential elections were held to elect a successor to complete the remainder of his five-year term, and PF candidate Edgar Lungu was elected. Edgar Lungu beat Hakainde Hichilema of the United Party for National Development by just 27,757 votes and the opposition has yet to accept the credibility of the election. Although previously the President had been elected in a single round of voting by the first-past-the-post system, in 2015 the National Assembly approved the change in the constitution to change to a two-round system. The constitutional change also introduced the concept of running mates; previously the vice president was appointed after the elections. The running mate, now being an elected member, can assume office directly if the president is deemed unfit to rule. Of the 159 members of the National Assembly, 150 are elected by the first-past-the-post system in single-member constituencies, with a further eight appointed by the President and a Speaker elected from outside the National Assembly. The voting age is 18, whilst National Assembly candidates must be at least 21. A total of nine candidates along with their running mates registered to run for the presidency. Out of the 46 political parties, only five managed to pay their candidate's deposit by the deadline of 17 May 2016. The deadline was subsequently extended by a day, with four other parties nominating a candidate. The race is expected to be a close race mainly between Edgar Lungu of the Patriotic Front and Hakainde Hichilema of the United Party for National Development. Both leaders competed in the 2015 presidential elections and Lungu won by a very narrow margin. Both sides traded accusations of inciting violence for political gain; the ruling Patriotic Front accused the United Party for National Development (UPND), of inciting unnecessary violence, and carrying out its “Operation Watermelon” to create tension in the country. In response, the UPND accused the Patriotic Front of politicising state entities against them. On 10 June, violent outbreaks occurred in Lusaka after the government made the decision to suspend the operations of The Post newspaper (one of the few independent newspapers in the country). On 23 June the government started taking action against The Post for unpaid taxes of around $6 million; the newspaper denied the claim saying the issue was still being discussed in court. The opposition accused the government of silencing the media to reduce their coverage. 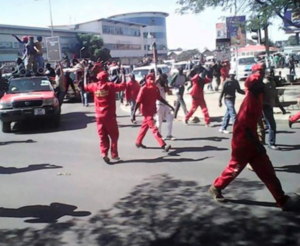 UPND cadres along Cairo Road as they marched to Chawama. On 8 July, police in Lusaka killed one UPND female supporter after they ambushed a group of supporters that were marching on the Central Business District after Police cancelled a planned rally in Chawama. Mapenzi Chibulu was pronounced dead on arrival at the University Teaching Hospital (UTH) and another male UPND cadre was seriously injured and admitted to UTH. On 9 July, the Electoral Commission of Zambia (ECZ) suspended suspended campaigns in Lusaka and Namwala districts for 10 days due to the rise in political violence in some districts which resulted in injury, loss of life and property. During the suspension, there was no public rallies, meetings, processions or door to door campaigns. All branded campaign motor vehicles in Lusaka and Namwala Districts were parked and were not allowed to be used for any purpose. The suspension was lifted on 18 July 2016. On 20 July Geoffrey Bwalya Mwamba, the vice president of the UPND, was arrested along with several party officials with the accusation that they were trying to start a private militia. The police raided his house and found petrol bombs, machetes and spears. The opposition denied the claims that the weapons were planted there after the arrest. The police raided the house following alleged political poster vandals hiding in the house. A total of 28 people were arrested in the raid. 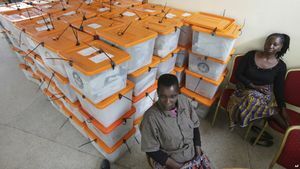 There was a lot of controversy in the printing of the ballot papers; previously all ballot papers had been printed in South Africa, but the Electoral commission of Zambia awarded the contract for the 2016 elections to a firm in Dubai. The contract was significantly more expensive and many opposition parties criticised the move. Parties opposed the move as printing the ballot papers outside Africa was expensive to verify and increased the chance of electoral fraud. To counter the suspicion of rigging, the Electoral Commission allowed party officials to travel to Dubai to witness the printing of the ballots; all ballot papers were to be only released if all party officials approved of the process. The printing was completed on 20 July 2016 and the ballots were transported to Zambia on 28 July 2016. However, concerns with respect to the transport and distribution of the ballot papers then arose. The Zambian Air Force were responsible for distributing the ballots across the country. Polling stations opened at 06hours and where expected to closed at 18hour those that opened late where given extra time the last polling station in Nalolo district Namawunga polling station closed at 0200am the following day cause it opened late. The vote turnout was high as went to the polls as early as 02hours waiting for the polling stations to open. In the Western Province the first voter arrived at 02:00am but had to wait for the Litunga to cast the first vote. The main opposition critisized the electoral commission for participating in fraud as they significantly delayed the announcement of the results. Claiming that the slow counting of the votes is unexplained. EU observers commended the Zambian people for conducting peaceful elections and deemed the election process free and transparent despite some delays. However, the EU commission accused state media of being unbalanced in its report. The US based Carter Center said that the election was conducted in a highly tense atmosphere and that there is alot of polarization due to inter-party politics. The Center is also concerned with the huge delay in the announcement of the results by the electoral commission. African Union: Goodluck Jonathan, the head of the AU observer mission in Zambia, also deemed election day to have been peaceful. However, like the EU, he noted that state media had been biased towards the ruling party. Furthermore, he also added that holding the referendum at the same time as the elections caused confusion to many voters and added complexity to the election process. Southern African Development Community: The SADC observer mission along with COMESA, Commonwealth, and the International Conference on the Great Lakes Region all concluded that the election was conducted in a free and fair environment. Jakaya Kikwete, leader of the commonwealth observer mission in the country said that the pockets of violence in the country and the way the police handled the situation was unfortunate. PF members took to the street to celebrate Lungu's victory, whilst riots took place in most parts of the country leading to property being destroyed and roads blocked. 133 protesters were arrested.. The UPND rejected the results, saying that the electoral commission had colluded to rig the result in favour of Lungu, also stating that they would appeal the results at the Constitutional Court, accusing election officials of fraud during the count. On 16 August, Lungu held a celebratory rally at Woodlands Stadium in Lusaka as his re-election secured him another 5 years. ↑ "Only 5 Parties to take party in the Presidential Elections as Frank Bwalya mocks Eric Chanda", Lusaka Times, 18 May 2016. This page was last edited on 13 September 2016, at 19:52.